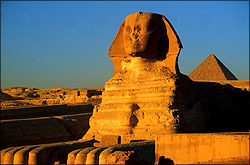 The Sphinx, which embodies the body of a lion and the head of a pharaoh, is believed to be the head of Khafre and his guardian spirit for his entire burial complex. Carved from the natural limestone of Giza, the sphinx has disintegrated over the years, entire pieces dropping off to the desert floor below. It is not known to have chambers inside, like those found in the pyramids at Giza.